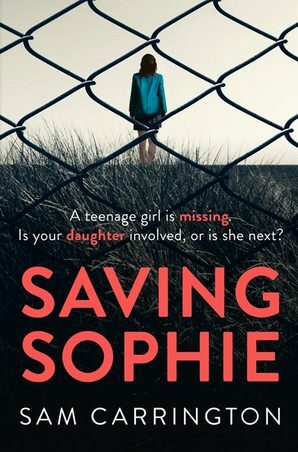 Saving Sophie is a taut thriller where although I was gripped and couldn't really put it down, I also didn't feel any fear like I often do with a psychological thriller, nor did I have any theories running through my head as I was reading it as to what really happened. There are some shocks and surprises but nothing that really made me gasp out loud, or make me catch my breath. The story is told by three view points, one of which is very unreliable in terms of information, one of the others is a character I should have sympathy with but just couldn't find it, and the other was the police which I did really enjoy. Sophie is returned home one evening by the police quite early, appearing drunk and out of it. In the morning she has no recollection of the night before, but her best friend is missing. Her mother Karen is agoraphobic and suffers all sorts of anxieties, and comes up with all sorts of theories about what happened that night. Saving Sophie is a strong debut novel by Sam Carrington that I managed to read in an evening. It held my attention at all times, and had a narrative that retained my interest while building a good picture in my mind. I'll be very happy to keep an eye on this talented author to see what they come up with next. Thank you to Netgalley and Avon for this review copy. This was my honest opinion.